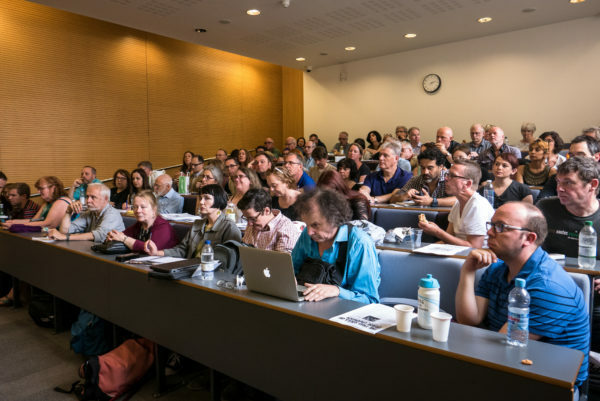 On Saturday 9th June, around 80 UCU members, all but one or two of whom attended this year’s congress two weeks ago, came together in London for a meeting to discuss After UCU Congress…where next? The meeting was called by London Region’s #UCUTransformed, agreed by 130 Congress delegates who met on the evening of the first staff walkout, and was supported by Branch Solidarity Network. Members came from branches all over the country: universities of Edinburgh, Bournemouth, Leeds and Leeds Beckett, Liverpool, Lancaster, Brighton, York, Kent, Oxford, Cambridge, Hertfordshire, Royal Holloway, SOAS, Imperial, Kings College, Central School of Speech and Drama, City, St Georges, Reading, Queen Mary, London Met, LSBU, Roehampton, Westminster, Writtle University College; colleges of Sheffield Hallam, Bourneville, Epping Forest, Westminster Kingsway, Tower Hamlets, Lewisham Southwark, Lambeth, Hackney, North West London, Redbridge, Croydon, City and Islington; Sutton and Hackney Adult Education; South West Region, London Region and Yorkshire and Humberside Retired Members branches; and Disabled Members and Black Members committees. The discussion was centred around the fallout of the staff walkouts, the refusal to allow motions 10 & 11 to be heard, the shutting down of congress and how the issue of democracy links to the campaigns on pay, pensions and equality in HE and FE. There was a wide-ranging and serious debate about how to respond to the aftermath of Congress and was conducted in a calm, thoughtful way as members sought to find a way forward on issues by engaging with each others’ contributions, processing arguments and suggestions and building organically towards some jointly agreed outcomes and proposals. There was general agreement on recognising the importance of challenging the GS and linking the campaign for democracy with the struggles over pay, pensions and Equality and, through this, building new democratic structures from below. – get as many branches as possible to the FE Pay National Activist meeting on 29th June in Manchester. Details to follow. The meeting also agreed to hold a further meeting in October which unites all the groupings under one roof – #UCUTransformed, Branch Solidarity Network, UCULeft, #OurUCU etc.